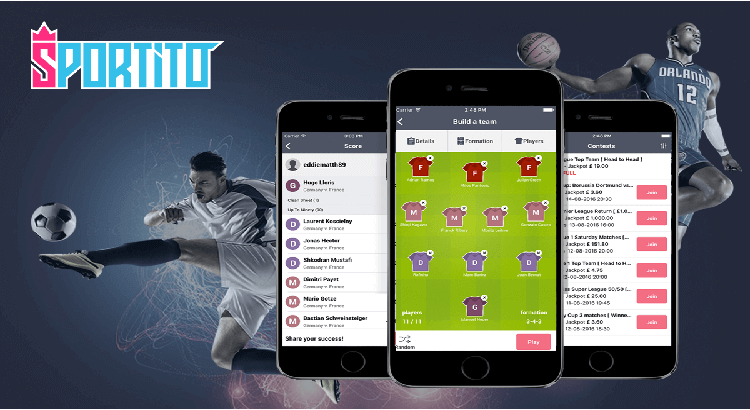 Playing Daily Fantasy at Sportito is super easy and fun. Thanks to our very user-friendly platform, it is a breeze to find all the information you need to discover and enter Contests and get all the necessary details you need in order to play, and play with confidence. Our interface makes this possible through “Sportito Contest Card”. When perusing around our Lobby – the place where you can find all the Contests we are running – you can click on any Contest and a Sportito Contest Card will appear to the right of the screen. Here you have all the information you need to make the best choice, in order to start playing and winning. Here at Sportito, every Daily Fantasy competition we run is called a ‘Contest’. All contests can be found in the Lobby section once you have logged in. Once you click on Lobby, you will arrive at the below page. As you can see, this is where all the Contests can be found. There are five columns describing each contest: Contest Name, Entries/Size, Fee, Prizes, Starts (Starting Date) and Status. Each column is self-explanatory. The Contest Name is obviously the name of the Contest. In order to find contests in a particular league or tournament, use the filter ‘Filter by Tournament’ just under the heading, Contest. The Entries/Size column refers to the number of available spots for participants. The number on the left indicates how many participants have already signed up. The number on the right shows the maximum number participants. The Fee is the cost to enter the game and the Prize shows the total pool of prize money. This money does not necessarily go all to the winner as it may be shared in the cases where there is more than one winner. The Starts column indicates when the game is commences and the last column shows your own Status. If you have not entered the contest, it will read Join. If you have entered the contest, it will read Joined. With the Lobby explained, the next important part of the platform to understand is the Sportito Contest Cards. Once you click on a Contest, the below Sportito Contest Card will appear. The Sportito Contest Card gives relevant information on the contest. You will notice there are four tabs at the top of the Sportito Contest Card. Detail is the information shown in the above screenshot. The next tab is Matches, which lists all the matches involved in the Contest. 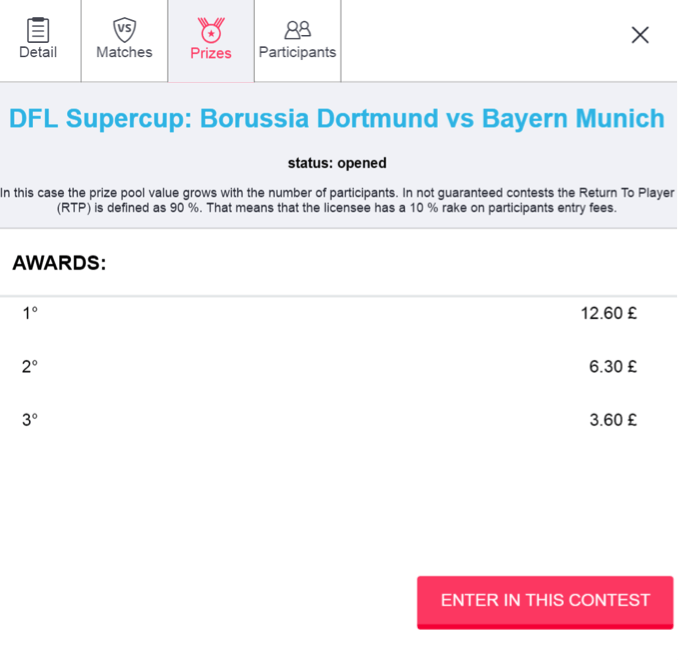 Prizes shows how the Prize Money will be split between First, Second and Third place and finally, Particpants, which lists the Usernames of all participants involved. For more information of each of these tabs of the Sportito Contest Card, read on. The Tournament refers to competition, league or cup that the Contest is created for. 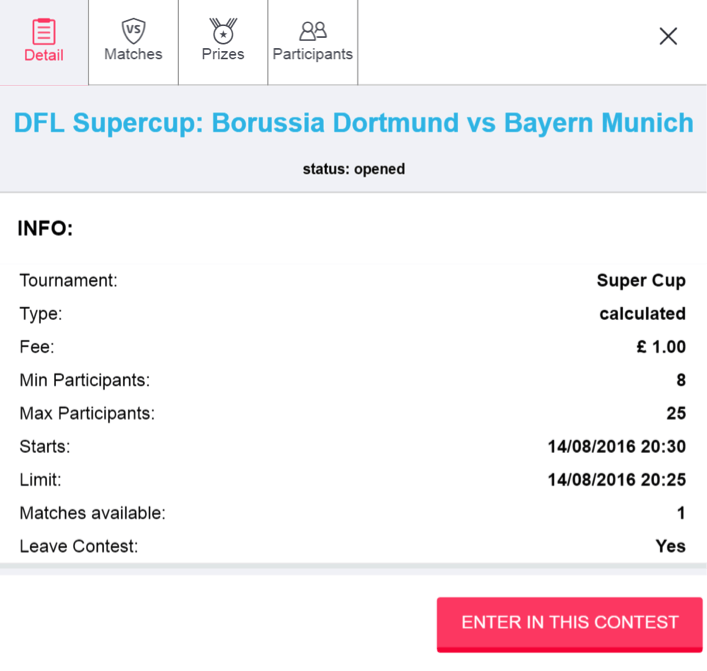 For example, again referring to the previous screenshot, you will see that is reads Super Cup, as it is referring to the German Super Cup match between Borussia Dortmund and Bayern Munich. The Type refers to whether the Contest is guaranteed or not. What is the difference between a Guaranteed and Not Guaranteed contest. It is simple. The former is a contest where the minimum prize pool is guaranteed in advance. In contests that are not guaranteed, the minimum prize pool is not guaranteed but is allowed to grow with the increase in the number of participants. Every contest has a minimum and maximum number of participants and this is what the next two bullet points refer to. Following these, the Starting Date for the competition is listed as well as the Limit, which refers to the final date and time that entries can be submitted. Matches Available refers to all the matches involved in the contest. For example, with the German Super Cup final, there is only one match so only match is listed. But, as another example, if are contest was created for just Round 1 of the English Premier League, then there would be 10 matches list involved all 20 teams. The final point listed is Leave Contest. This refers to whether or not participants are allowed to leave the Contest after having signed up for it. This section is fairly straight forward. Whereas in the Detail Tab, as described above, lists the number of matches involved in the Contest, under the Matches Tab one can find all the actual matches to take place in this Contest. To go back to the example of the German Super Cup again, as there is only one match, only the game between Borussia Dortmund and Bayern Munich is listed. Perhaps the most important and exciting piece of information for players. How the prize money will be awarded to the winners of each contest is listed here under the Prizes tab. Whereas in the Lobby the total prize pool money is listed. Here under the Prizes tab it is displayed how this prize pool will be divided between first, second and third place or however according to the structure of that particular contest. For an example, see below. Last but not least, the final tab in the Sportito Contest Card is Participants. This is even simpler than the previously described tabs. Here under this Tab all participants who have signed up for the contest have their Usernames listed.